Green means go, red means silence! 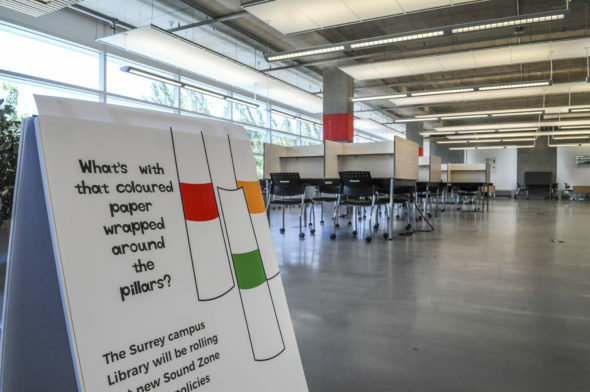 This summer, KPU will be soft launching new rules regarding food and noise levels in the Surrey campus library. The new system will divide the library into three separate zones. Todd Mundle, the KPU University Librarian, says that the idea for the new rules came from feedback from student surveys for the library. As of right now, the Surrey campus library is the only KPU library to begin implementing the rules. Mundle explains that Surrey’s library is ideal for introducing the zoning system because of its larger size. The three-zone colour code was designed to be similar to a traffic light. The green zone will cover half of the first floor, designating the area where students can go when they need a collaborative space to socialize with their peers at a respective sound level. The yellow zone is the quiet space, where students can talk to their peers at a hushed level. It will be located in the computer areas and on the entirety of the second floor. The red zone is the silence space, which will be located on the third floor. Mundle says this area will most likely be the easiest to manage. In tandem with the colour-coded sound regulations, the library will also be implementing new food and drink rules. The student surveys which the library conducted contained many complaints regarding smelly foods which were found to be distracting. Mundle explains that the garbage system in the library is not adequate enough for it’s size, but they are working to change that. “We are going to restrict food into what we call the soft seating area just right outside the checkout area. People with covered drinks can certainly take them to other zones but we are trying to corral the food into this one spot,” says Mundle. The new library rules will be in full effect on the Surrey campus library beginning with the fall semester. Students at the Richmond, Cloverdale, and Langley campuses can also expect similar rules at their libraries in the future. To help students adjust to the change, better signage of the zones will be put up. The library will also be handing out bookmarks to students to remind them of the rules.